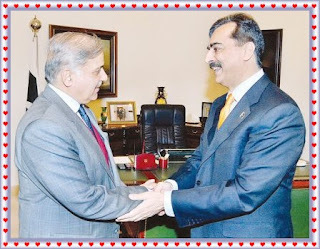 Today, on 30 October 2010, Yousaf Raza Gillani Prime Minister of Pakistan and Shahbaz Sharif Chief Minister of Punjab jointly visited Gujrat. They participated in a function of Government Zamindar College Gujrat. Function was organized on the occasion of anniversary of the founder of the college, Sir Fazal Ali. Local Authorities, Members of Peoples Party from Gujrat, Students and Peoples Party Workers attended the function. Nawabzada Ghazanfar Gul and Dr. Nizam ud Din (VC of University of Gujrat) are also there. Nawabzada Ghazanfar Gul is the grandson of Nawab Sir Fazal Ali Khan. Nawabzada Ghazanfar Gul is former MNA and a member of Central Executive Committee of the Pakistan Peoples Party. Nawabzada Ghazanfar Gul was appointed as “PM Advisor on Political Affairs” yesterday. During his address, Prime Minister said that they are altogether for the development of country. He said that nationalization policy of education by his government was a wrong step and he admits it whole heartedly. He said that 5 crore rupees for “University of Gujrat” which are announced in an earlier visit by PM, will be released soon. PC-I has been approved to built a Live Stock Center in Gujrat. He also said that their government will continue aid, support and rehabilitation of flood affectless. Both belongs to different political parties; Syed Yousaf Raza Gillani belongs to PPPP (Pakistan Peoples Party Parliamentarian) and Mian Shahbaz Sharif belongs to PML-N (Pakistan Muslim League Nawaz), but it is very good news that both political leaders and heads of government are jointly visiting a college which shows their passion for education.